This is closer to a Spanish-style stir-fry, a version of what my in-laws call a chuck-in rice. It is nonetheless delicious and it’s very quick to make, assuming that you have some cooked basmati sitting in the fridge. If not, it’s worth cooking some just to make this. It’s the perfect supper to eat out of a bowl while watching something brainless on the telly after a hard day’s work. Add a crisp green salad if you’re feeling energetic enough to toss it. Or find a man to do it for you. In a deep frying pan, cook the chorizo until it’s beginning to brown and its oil starts to run. Remove and set aside. Add a little olive oil, one or two tablespoons, and fry the onions until soft and golden. Throw in the peppers and cook until softened. Now add the garlic and paprika and cook for a minute more. 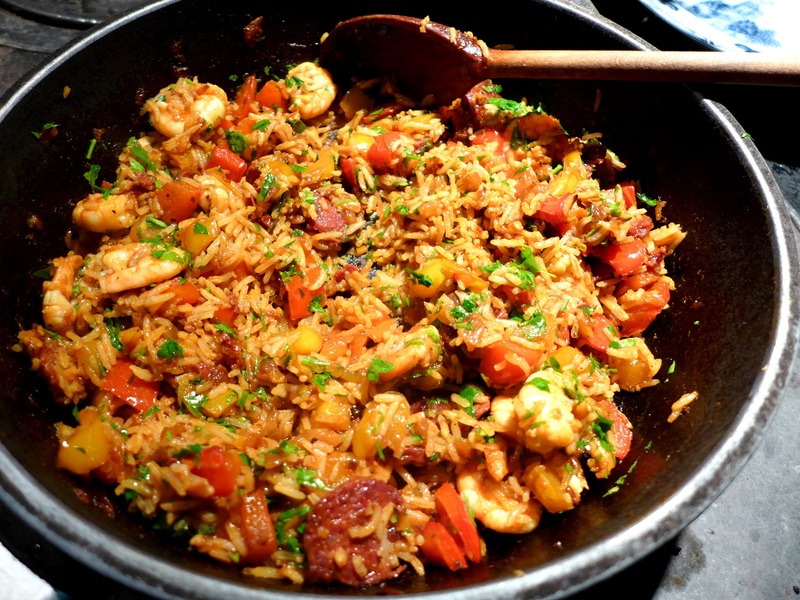 Put the chorizo back in the pan, along with the rice, and stir-fry until the rice is heated through and the flavours have blended. Add the prawns and stir-fry until they’re pink and cooked through, just a couple of minutes. Chuck in a handful of parsley and squeeze over some lemon juice. Stir to mix and serve with few sprigs of parsley to garnish and more lemon wedges on the side. 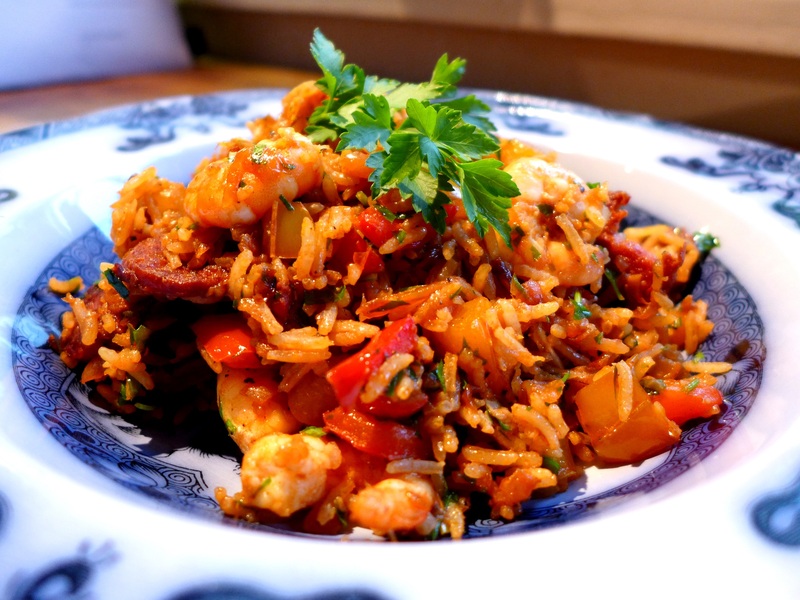 This entry was posted in Fish and shellfish, Mains, Pork, ham and bacon and tagged quick suppers, Spanish-style rice, stir-fried rice with prawns and chorizo by Linda Duffin. Bookmark the permalink. The best paella I’ve had came from our local restaurant in France. Huge numbers of ex-Spanish live in that part of France (immigrant workers, civil war all kinds of reasons) and have made a huge impact on local cuisine. This was definitely a good influence! This isn’t rice. This is my last meal! Gorgeous!